A BBC website article ask the question: “Are pancakes now Britain’s favourite food?” As an expert in the field, I would have to say no. Just about everyone loves pancakes – we all remember Pancake Day as children and it was probably the only day of the year when we were allowed to eat sweet food as our main meal of the day! So deep-down, most of us have happy associations with the pancake. 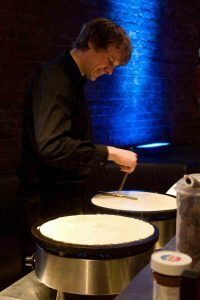 As the article rightly points out, most city centres and markets now have a resident crêpe van, (and as the only company in the UK to specialise exclusively in crêpe catering, we also know that that pancakes at a weddings are also very popular!) but the “French crêpe” that we produce is a very different item to the American and British pancake. To attribute such popularity to the pancake based on BBC website visits is probably a little misleading. Pancakes (and crêpes) are quite difficult to cook correctly, so it is no surprise that people will try to seek information when they struggle in the kitchen. With the number of variables when cooking a crêpe or pancake being high, everything has to be just about right for the food to turn out correctly. Too much millk? Runny pancake. Too little egg? Runny pancake. Cooking surface not hot enough? “Doughy”, raw pancake. It is because they are so difficult to cook correctly that I believe “pancake” is the most searched for term on the BBC website. I take great interest in pancakes and crêpes and have tried them in various countries and extensively in the UK. I have to be honest, I do not rate the majority of the ones I try. Even the “professionals”, using professional equipment, usually struggle to produce a good-quality foodstuff. As a high-end wedding catering company, we know that our crêpes are good. Perhaps even very good. But now in our twelfth year, even we are still learning and picking up new skills to improve our pancakes that little bit more. So if most of the professionals still haven’t fully mastered it, is it any wonder that pancakes are the most searched for term on the BBC website?